I have created the best and most easy Instant Pot hummus with canned chickpeas! If you are like me, you’re inpatient and want your deliciously creamy homemade hummus NOW. Ain’t nobody got time to soak dry chickpeas for eight hours! 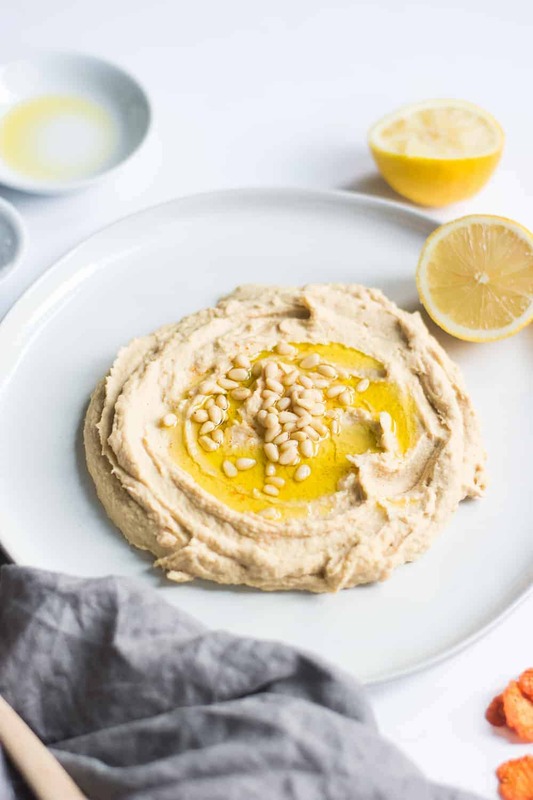 This Instant Pot hummus recipe using canned chickpeas will take you only 20 minutes to make beginning to end, as opposed to an entire day! And it’s gluten free and vegan. Yes, please. First up you need an Instant Pot. I recommend the 7-in-1 6 quart model. It’s good for a family of 4-6 and can do all the things you would ever need in a pressure cooker! Click here to download my free Instant Pot Starter Kit! Canned chickpeas – yes! This is the key to making this hummus easily and quickly. FYI, garbanzo beans and chickpeas are the same thing. Tahini – you can find this in the condiments or Middle Eastern cuisine section at the grocery store. Or you can buy it here. 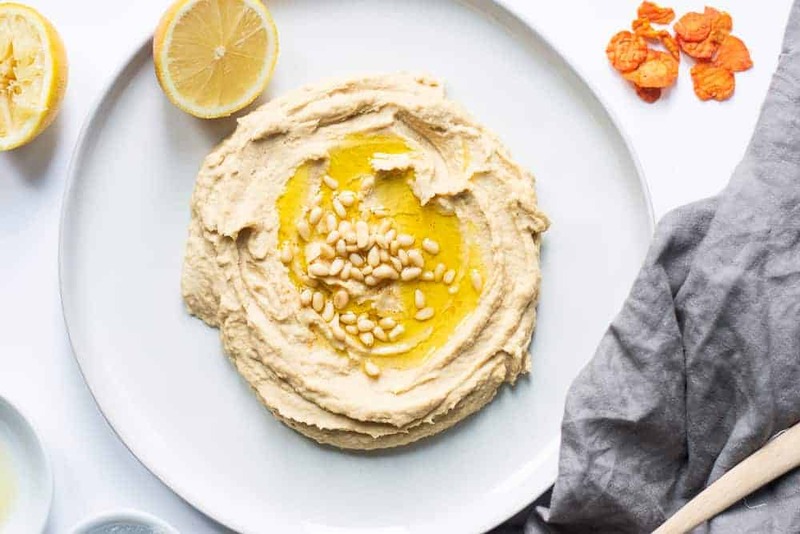 Olive oil – I debated testing out avocado oil, but then it wouldn’t be true hummus, am I right? Garlic – for that optimal flavor! Lemon – again, optimal flavor and giving it some zing! The best chips for dipping hummus! I like to dip veggies in hummus for a healthy snack. And GUESS WHAT? Bare Snacks released their new veggie chips! I am so excited to partner with them to let you in on the news! You know how much I love their fruit chips and put them on everything, like in these baked stuffed apples, or this superfood mermaid toast. And now there are VEGGIE CHIPS! I cannot contain my EXCITEMENT. I used the carrot chips with sea salt with the hummus, but they also have beet chips, and sweet potato. I know. You should be excited. Think of all of those magnificent dipping combos! 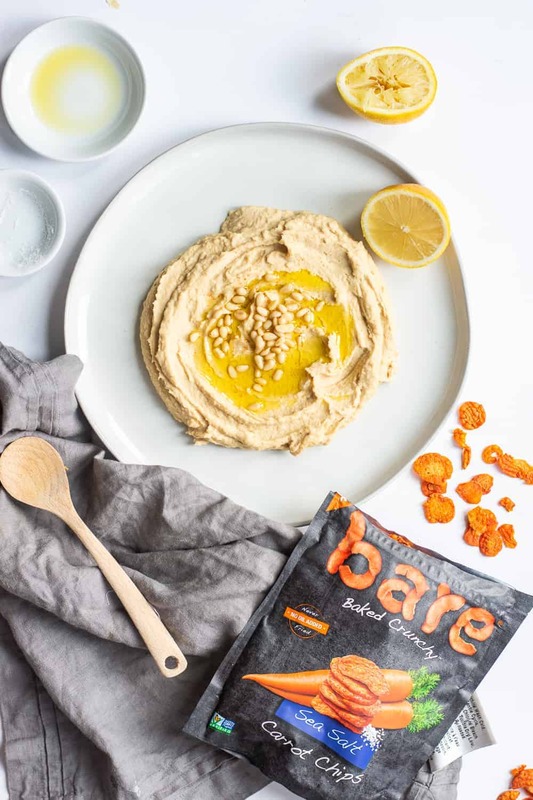 This hummus is a great base to add in different flavors to go with the awesome flavors of the Bare Snacks veggie chips. Click here to see where you can buy them in store. And click here to buy on Amazon. Alright, so here is the thing about using canned chickpeas: it takes a fraction of the time. You only have to cook in the Instant Pot for 10 on manual high pressure, and then quick release. Only 10 minutes of cooking time, and then 10 minutes to whip everything together! Some people have asked why the need to heat canned chickpeas? I’ll tell you why! Cooking the chickpeas at high heat and getting them soft ensures they blend well so you have that dreamy, creamy and smooth hummus. Trust me, it’s important. Especially if you don’t have an expensive, high-powered blender. I tried this without heating the chickpeas, and it was chunky and not the quality you deserve! Here are some tips to make sure it is creamy and delish. Make sure you reserve water after cooking the chickpeas. You have to use enough liquid to make it creamy, and this already has that great flavor, as opposed to using regular water. Use high quality tahini and olive oil! These are items to spend a little extra on. And make sure you don’t get too heavy-handed with the tahini, or it can ruin the taste. Use a high quality food processor or blender to whip together. I use this food processor and this blender to make all my hummus and energy bites. Alright, are we ready to get to the making part?! I know you are! 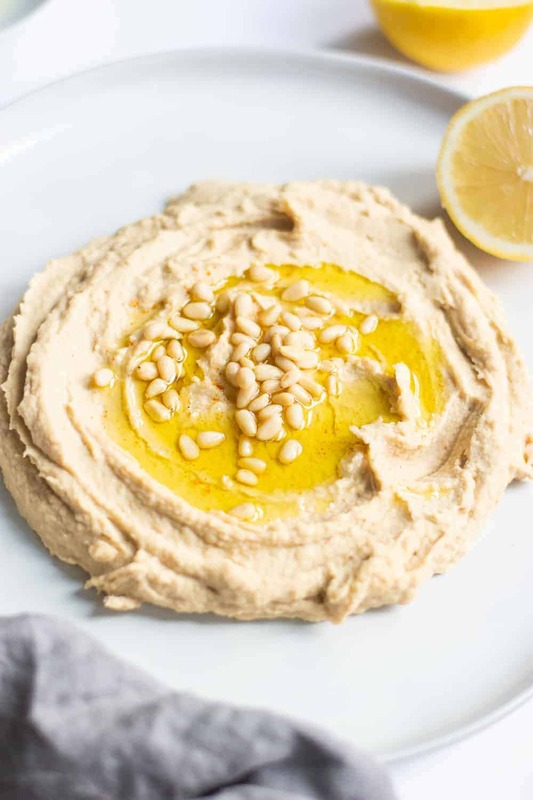 Grab the recipe for this super easy Instant Pot hummus with canned chickpeas below and ENJOY! 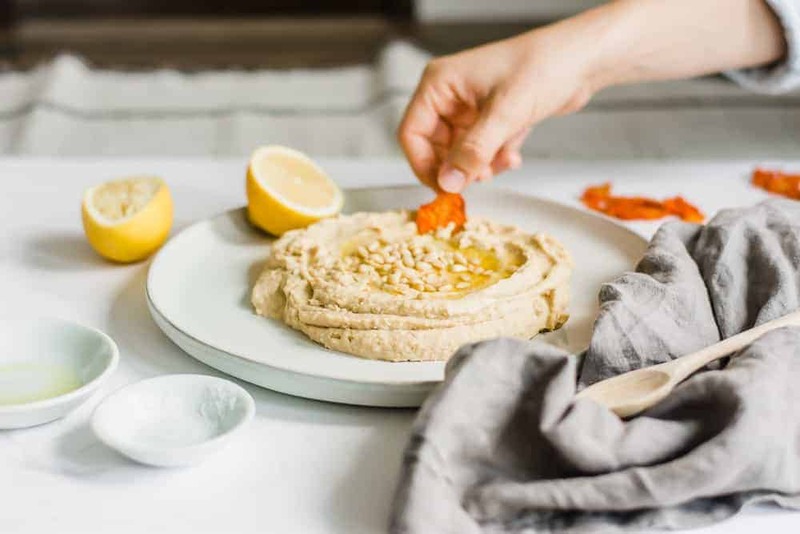 Make this easy Instant Pot hummus with canned chickpeas. It's creamy and smooth, and takes only 30 minutes to make. A great gluten free, vegan side or appetizer the whole family will love. In the bowl of your Instant Pot, pour in chickpeas and water. Lock lid, seal, and cook on manual high pressure for 10 minutes. Quick release by flipping valve to venting. Strain chickpeas and reserve water from pot. Add warm chickpeas to a food processor. Mix in garlic, tahini, olive oil, lemon juice, paprika, and salt. Mix on high until smooth. Add in reserved water as needed until smooth and creamy. Dish into a bowl and top with pine nuts and a drizzle of olive oil. Serve with veggie chips and favorite dipping items. Enjoy! 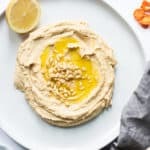 This was an excellent recipe, and makes a much better hummus than using the chickpeas straight out of the can, thank you! This is the best hummus I have ever made. Thanks for this recipe. Ahh that makes me so happy! Glad you love it!